When planning European vacations, many travelers tend to focus on the traditional favorite locations like the United Kingdom, Spain, Italy, France, and Greece, but there’s much more to Europe than that. The continent is home to many different countries and regions, each offering their own unique advantages and cultural identities. If you’re looking for a European vacation with a difference, a trip to Scandinavia could be the perfect option, and there are many different ways to enjoy countries like Sweden and Norway. Many people choose to take Scandinavian cruises, for example, stopping off at major cities like Copenhagen and Stockholm, while others prefer to simply fly out and explore the region for themselves. If you want to see and experience as much of Scandinavia as possible in just one location, Sweden is the place to be. Situated in the heart of Scandinavia, bordered by Norway, Finland, and Denmark, Sweden offers an authentic Scandinavian experience every step of the way. Sweden’s natural landscapes are dominated by huge swathes of forests, its cities feature extraordinary old architecture, and its cuisine offers some of the tastiest dishes you could hope to find in this part of Europe. The country is also filled with surprises, like having a long list of impressive, exciting beaches. Sweden is typically associated with snowy forests, but it has around 2,000 miles of coastline all along its eastern and southern regions, with lots of gorgeous sandy stretches for sunbathing, swimming, and more. Not many people would think of Sweden as an ideal beach destination, but this Scandinavian country has a long coastline and some surprisingly breathtaking beaches that people of all ages can appreciate and admire. The heart of Scandinavia is home to some truly captivating coastal regions, with mind-blowing views and a long list of activities just waiting to be enjoyed. If you’re planning a trip to Sweden, read on to learn all about the country’s best beaches. One of Sweden's major cities is Malmö, and if you happen to be staying in this area or just passing through on your Swedish vacation, you simply can't afford to miss out on the beautiful beach of Ribersborg. Offering awe-inspiring views of the city skyline and natural surroundings, Ribersborg Beach is a super spot to sit on the soft sand and let the hours pass by as you slip into a state of total relaxation. The beach has some decent amenities just nearby too, including restrooms, eateries, and green spaces for games and picnics. This also happens to be a dog-friendly beach and a good spot for water sports, with kitesurfing in particular being very popular here. If you happen to be staying in Sweden's capital city of Stockholm and still want to check out some sandy spots on the Scandinavian coastline, head on down to Langholmsbadet Beach. It's very easy to access from the downtown districts of Stockholm and is well-stocked with amenities; lots of good stores and restaurants can be found nearby. The only issue with this Swedish beach is that it can get quite busy, especially on sunny days as the locals and Stockholm tourists all head on down to take advantage of the good weather, but if you don't mind the crowds then there's a lot to love about Langholmsbadet Beach. Located on the 'Hoga Kusten' (High Coast) of Sweden, Norrfällsviken is one of the most breathtaking beaches in all of Europe. It's the sort of beach that makes you stop and stare in amazement, and most visitors are simply blown away to realize that such a unique and awesome beach could exist in such a typically cold and snowy country. The views from this Swedish beach are simply extraordinary, so you'll definitely want to bring a camera along, and the waters are very calm and gentle, ideal for anyone brave enough to do a little swimming. Getting to Fårö isn't the easiest thing in the world as its actually a tiny island which is located just off the shores of another island called Gotland. If you're visiting from mainland Sweden, you'll first have to get a ferry or flight over to Gotland and then get on board another boat trip over to Fårö. That sounds like a lot of effort just to see a beach, but when you step foot on the gorgeous soft sands of Fårö, you'll realize that the detour was definitely worth it. This is one of the most pristine and precious beaches in all of Scandinavia, and there are lots of good recreational activities to be enjoyed around the island like hiking and cycling. Located down in the southeastern part of Sweden, Sudersand Beach is found on Gotland. 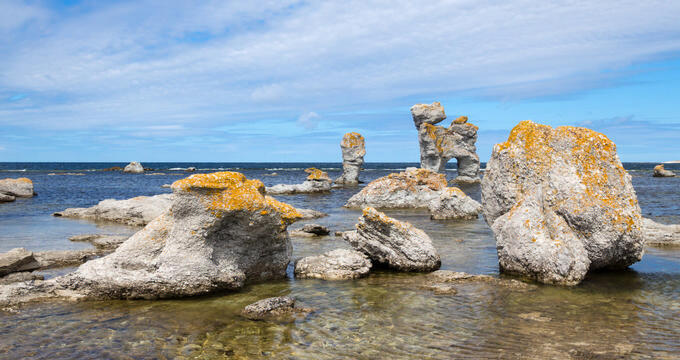 As we saw in the profile of Fårö, getting to Gotland involves taking a ferry or plane ride from the mainland, but it's definitely worth the trip. The beaches here are phenomenal, being made up of soft white sands and little rocky areas, with unique rock formations dotted out along the coastline like natural decorations. You'll find some good eateries and accommodation options on Gotland too, so you can spend a few days exploring the Sudersand Beach without having to worry about going hungry or thirsty.